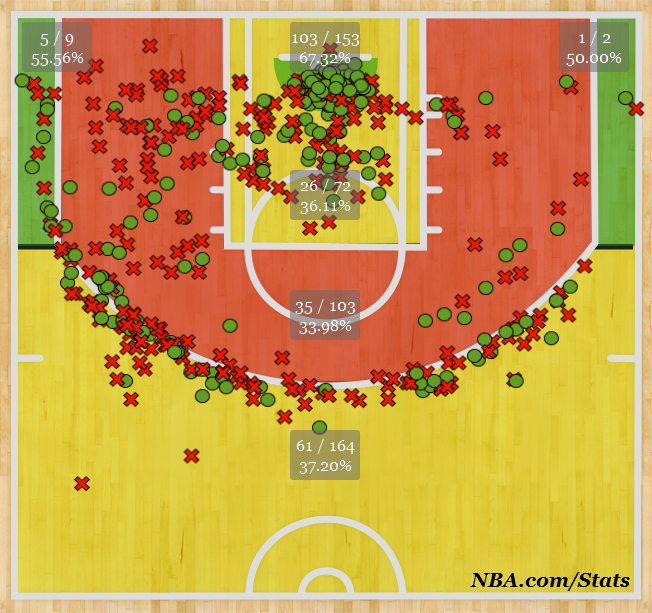 Last week, I started a weekly series built around unusual shot charts from teams. I really haven’t heard opposition or compliments about them, so I decided to make another post and proceed from there. I looked at which teams took advantage of the corner three, took a ton of shots from one side or the other, bombed away from three, or had a shot chart that was symmetrical. The Clippers gave San Antonio a taste of their own medicine after they beat the Timberwolves with the right corner three. 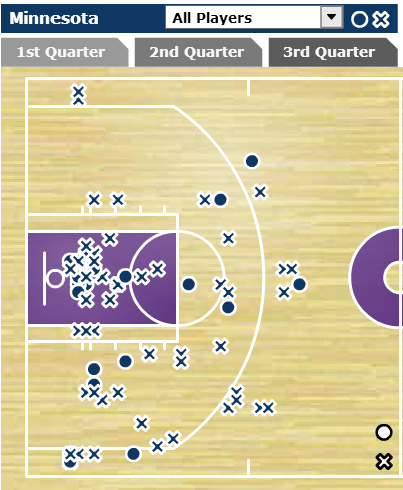 Los Angeles 10 attempted corner threes total, mostly thanks to Willie Green and Jared Dudley. 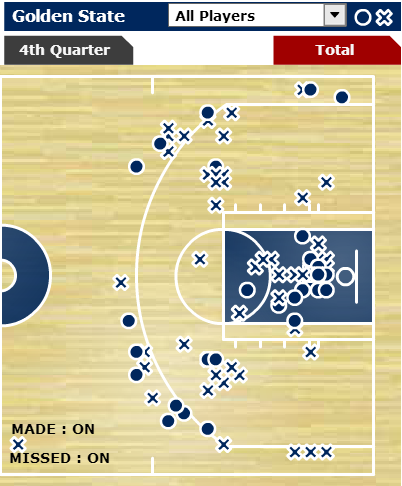 Jamal Crawford also made a 34-footer as time wound down at the end of the game. Classy. 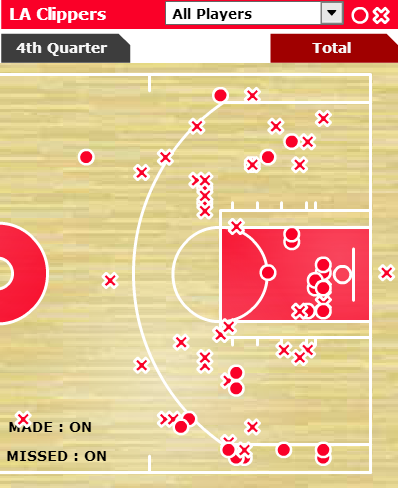 Players from the ’60s are throwing up at that shot chart. So many threes, so many long twos. I already went into detail about this game here, but it’s still worth mentioning that the Knicks chucked 41 threes with J.R. Smith accountable for 17 of them. New York won this Toilet Bowl, 107-101 in double overtime. Paul Millsap also joined in on the fun from the corners, making two of his own. The main beneficiary was Kyle Korver, though. For the night, he drained eight threes. As a team, the Hawks were 15-for-25 from behind the line. It’s an easy game. Minnesota took advantage of a team on their fourth game in five nights, jumping out to a 30-point lead (!!!) in the first half and scoring 98 points through three quarters. Damian Lillard nearly led a comeback from 30 down, but it was too big of a hole to climb out of. Shocking, I know. 54 points came in the paint for Memphis, 18 more than the Mavs. 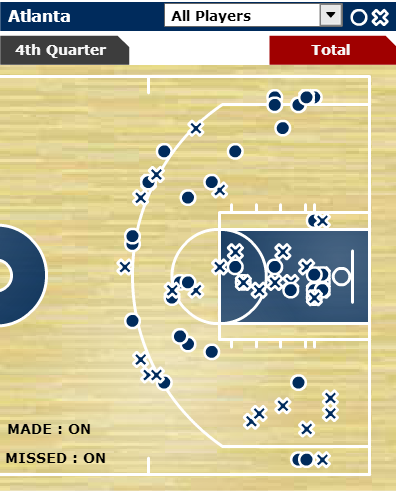 They even made their threes, shooting eight-for-18 from beyond the arc. It’s not every day that happens. Memphis has made only five threes per 100 possessions, according to NBA.com. That’s second-worst in the NBA only to the Charlotte Bobcats. Overall, Memphis took 20 more shots than Dallas, but it wasn’t enough. 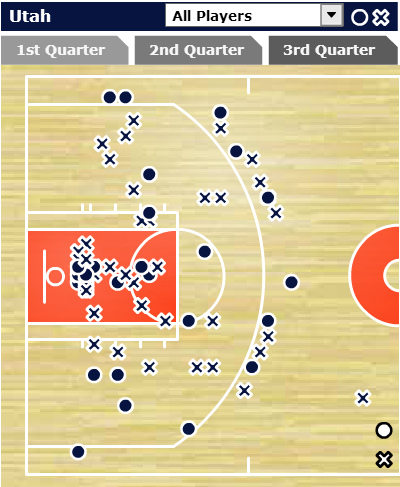 They were 29-for-75 inside the three-point line, which amounts to a Ricky Rubio-like 38.7 percent. The Grizzlies kind of really miss Marc Gasol, and their 2015 first round pick they owe Cleveland is starting to look juicy with every loss. Memphis lost this game, 105-91. 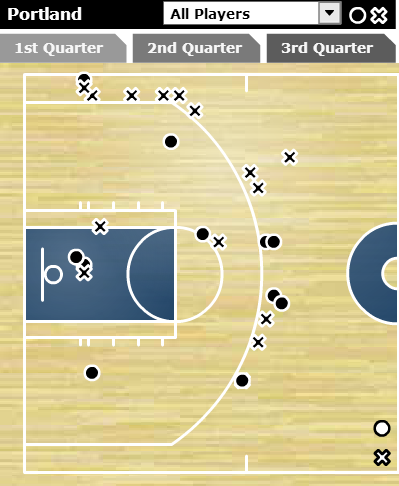 It’s not all that surprising when no Timberwolf consistently in the rotation is left-hand, but nonetheless it’s a shot chart worth looking at. It’s like having a batting lineup predominantly right-handed with 95 percent of the balls in play going to left field. It happens, I guess. If Kevin Love was a baseball player, he would definitely be that righty causing a defensive shift to the left side. He takes a ton of his shots from that area, but tonight the entire team jumped in. The results were miserable. The Lakers won 104-91. It was one of the worst losses I’ve witnessed this season. Early in the season I wrote about the Jazz’s embarrassing struggles from the arc, specifically in the corners. 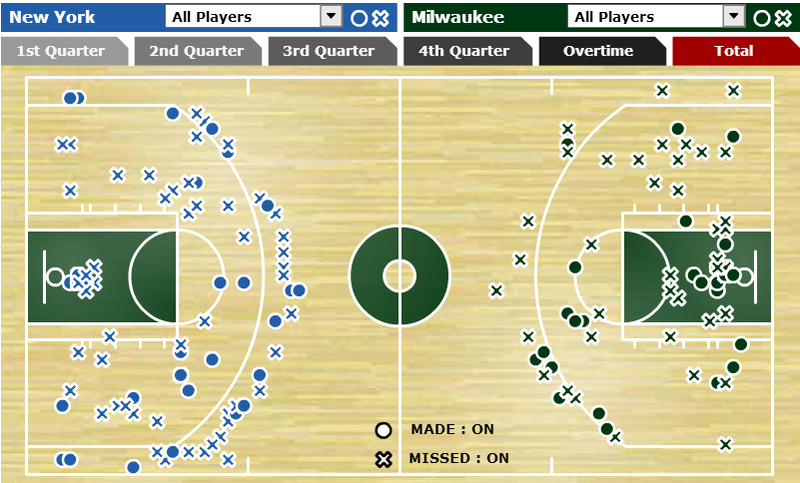 They’re up to 29.3 percent from that area of the three-point line. Lots and lots of progress, considering they were below 10 percent to start the season. Four of their 10 made threes came from Trey Burke, who seems like a very nice building block alongside Derrick Favors, Enes Kanter, and Gordon Hayward. Good times all around, and the draft pick Golden State owes them might have better value than expected. The Jazz won 88-85. It’s a pretty bad loss for Charlotte who has a chance to possibly finish over .500 this season. Cut the Warriors’ shot chart in half and it’ll look eerily similar. You might have to make every shot an X or an O, since the Warriors made a couple threes from the left corner and none from the right, but it looks pretty cool nonetheless. Eight of their 12 threes came from Stephen Curry and Klay Thompson. 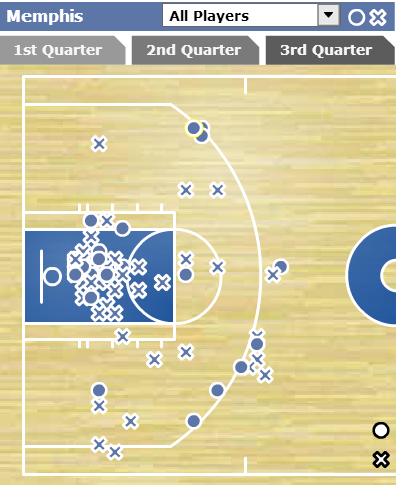 Not seen in that shot chart was Andrew Bogut‘s 20 rebounds. Golden State beat the Lakers, 102-83.